Here's a dip recipe in time for your Thanksgiving celebrations. My husband was waxing lyrical about a very simple but very delicious dip he had when he flew to Switzerland. And very simple, indeed, with just two ingredients. This is especially great for vegetable batons or biscuits for cheese. Thanks to Yvonne and Allan in Switzerland for this great dip recipe. Mix thoroughly with fork in a bowl until well combined and uniform. 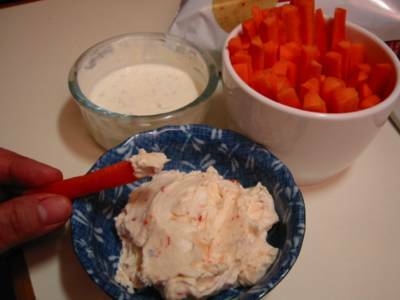 Serve with carrots, cucumber, and celery batons or other veggies. Also suitable with biscuits for cheese.